Power-to-gas can store volatile renewable energy from wind and solar electricity and convert it to renewable methane, with the addition of CO2 from natural sources. On the Aarmatt areal of Regio Energie Solothurn in Zuchwil, Switzerland, such a research facility has now started operating, within the STORE&GO project. 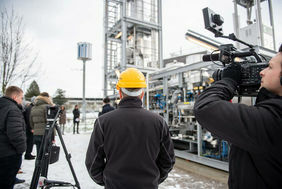 On Monday, January 28, 2019, everything on the Aarmatt areal in Zuchwil revolved around the lastest employees of Regio Energie Solothurn: around 700 billion microorganisms, known as archaea, are now producing methane from carbon dioxide and hydrogen in the STORE&GO research facility (biological methanation). 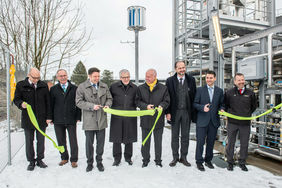 This renewable gas can then be fed into the communal gas network of Regio Energie Solothurn. 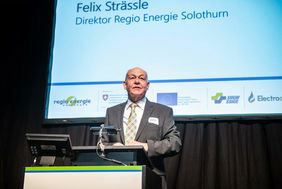 Said Felix Strässle, director of the Regio Energie Solothurn, in his opening speech. 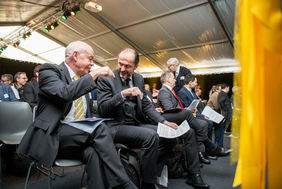 In addition to the project partners, guests from politics and industry as well as media representatives took part in the opening ceremony. In addition, Dr. Lucien von Gunten, scientific adviser to the European Framework Programs of the State Secretariat for Education, Research and Innovation, addressed in his presentation the importance of participation in the European research program Horizon 2020 for Switzerland. All speakers agreed that energy research is important for our future and indispensable for the responsible implementation of the Energy Strategy 2050 and the energy transition in Europe. 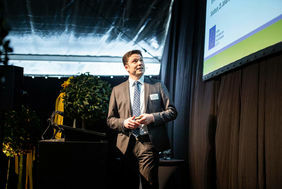 Dr. Frank Graf presented the facilities at the three locations as part of his presentation and addressed the significance of the research task for Europe. Regio Energie Solothurn operates the facility together with Electrochaea, the University of Applied Sciences Rapperswil (HSR), the Ecole polytechnique fédérale Lausanne (EPFL), the Federal Materials Testing and Research Institute (EMPA) and the Swiss Gas and Water Association (SVGW). 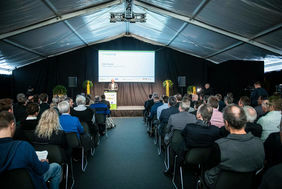 The research facility in Zuchwil is part of the European research program STORE&GO, which is investigating power-to-gas technology with three plants in Troia (Italy), Falkenhagen (Germany) and Solothurn (Switzerland). 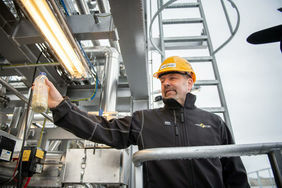 Responsible for the international project is Dr. Frank Graf, Head of Gas Technology at the DVVGW - Research Center at the Engler-Bunte-Institut of the Karlsruhe Institute of Technology. 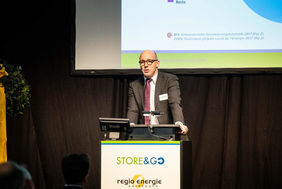 STORE&GO was launched as part of Horizon 2020, the European Union's research and innovation program.